So Michelle of Galleysmith and I thought since our joint reviews were so successful last August, we'd do it again. These are more in-depth than my usual reviews and discuss plot points in a non-spoilery way. 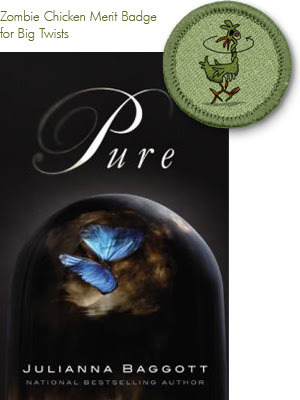 We'll post about a different book every Thursday, and our third book is PURE. You'll notice that I gave PURE the Zombie Chicken Merit Badge for twists. I felt it had a strong element of surprise and originality in the genre. Michelle and I decided to discuss four topics: Genre classification, Myths, Mutations and Pacing/Length. The first two we discuss below, the second two we discuss over at Galleysmith. PURE is an interesting case because you have an obvious post-apocalyptic scene going on outside the dome. People are fused to other objects, breathe in ash, don’t have much to eat, and long for what the “pures” inside the dome must have. People inside the dome may live luxuriously in comparison, but inside is no picnic either. The leadership forces “coding” (gene manipulation) on the population to control them, decides whether they can reproduce or not, and throws anyone who dissents into jail. PURE is certainly a tough one to classify into one particular genre/category. There are definite dystopian qualities to Pure too. As you mention the folks in the dome enacting population control through gene manipulation, but also outside the dome there is the roving patrols of the OSR. The taking of children of a certain age, the indiscriminate killing sprees, and other methods of control and persecution definitely speak to a more dystopian feel. Ah yes - the OSR. When you find out what they’re really up to - who they are really controlled by --- it’s chilling. Those were some of the most horrible scenes in the novel. If this were a movie (and it may well be one day, considering rights have already been optioned), those are the parts that would have me covering my eyes. I found it fascinating how the author incorporated classic tales such as The Swan Wife and the myth of the phoenix into her plot. Not only that, I also enjoyed her exploration of myth creation and its dissemination (i.e. the message from the dome, the “whispers” and the Good Mother). It added a whole other layer to the story for me. But do you think that it was too subtle? What about those who may not know those myths, does it really enhance the story or just give a bit more to those in the know about the particular myths? You’re right that literary allusions are tricky, since not everyone is going to be familiar with them. Heck, there was probably a bunch more stuff in there that I missed. But it does point to the kind of depth that gets books included on school lesson plans. I’m sure English teachers would love to pull this apart. I agree, there is no question there is a lot of depth to this book but I wonder if some of it is too subtle. For me, if there was a bit more definition of that mythology I may have walked away from the book feeling more of it’s meaning. This is a huge factor especially if those feelings and that meaning was significant to the plot of the book. Sure I got the Phoenix references, but the others, not so much which is a shame. Visit the official book website for more info and to read the opening pages. Also, check out the PURE preview interview Julianna did last Dystopian August. I have one copy of PURE to give away today curtesy of the publisher. To enter, fill out this form by Feb 24, 2012 at 11:59 pm CST. US and Canada only. The trailer is gorgeous, by the way. I think I haven't felt so... uneasy in a long time. The girl with a doll hand may be the creepiest thing I've seen in a while! Now I want to read Pure just so I can figure out what is really going on with the OSR! This sounds awesome. Thanks for the chance to win a copy! You're making me want to read this. It sounds different. Thanks for the giveaway. Great post I really enjoyed this book and i Love the trailer for it! Really do like your conversational review. So much to look forward to when I read the book. Can't wait! I have this book, and need to make time to read it soon. I have read some pretty amazing reviews of it lately, and it seems both unique and interesting. Fantastic joint post today! Oh yes, I want to read this one very badly. Thanks for the chance to win! This book has been on my mind since I read the synopsis for it a few weeks ago. It sounds so unique! Can't wait to get my hands on it! :-) Thanks for a FABULOUS discussion post! This book looks amazing! When reading dystopian fiction it always makes me wonder what the world would be like if the events in the book actually came true. It is a scary thought and why dystopian fiction is one of my favorite genres! Thanks so much for the review! This sounds great! I'm getting so many good book recommendations this month, I have to find time to read them all!! Your review made this book so intriguing! I was already curious to read it but now it seems like a must have. I'm looking forward to know more about this OSR stuff. The idea of being fused to an object! Scary! Pure sounds really great. Can't wait to read it. I enjoyed your review and the way you broke down the topics for each reading. It sounds like a good book. This books sounds so interesting plus the cover is beautiful. I plan to read this soon. This was definitely a daunting book going into it. But I loved it. I think it was well worth the massive size. I can't wait for more in this series. I just won this book from another book blog and I'm SO excited to read it! The premise just sounds completely crazy and the idea of people living with an assortment of random objects attached to them sounds so cool! 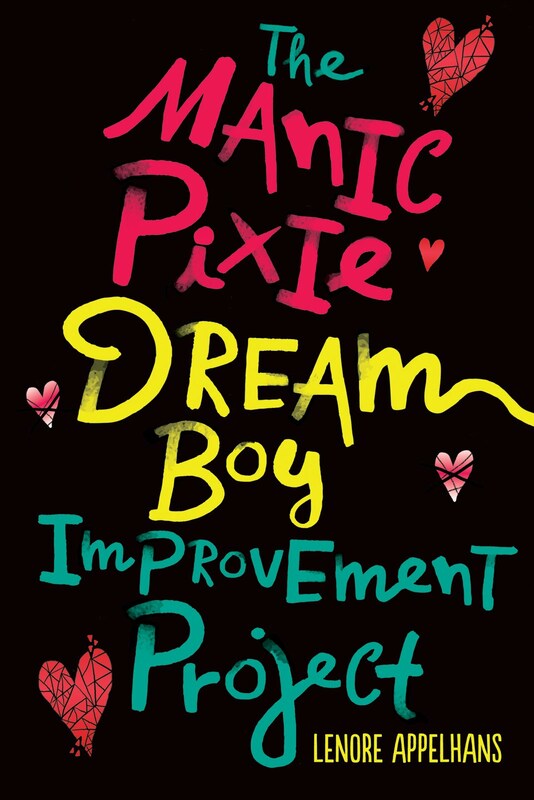 I heard before good things about this book, but now....I NEED TO READ IT NOW. The idea of two worlds, and the differences between them. Is like in the real world we live in, just that in ours everything is masked. I'm reading this book and I can't put it down! I haven't seen the trailer yet.